Add This Monitor To Any C-Mount Device, No Computer Necessary! 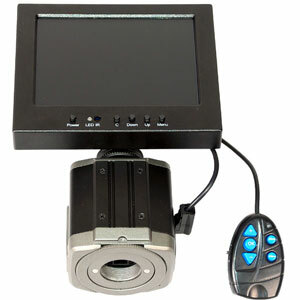 Upgrade any microscope with this camera and its genuine Sony electronics and a 5-inch LCD display. Now you can view your magnified target using a bright, clear monitor rather than microscope eyepieces. While this is typically done using a camera/computer combination, sometimes that is more complex than the situation requires. By connecting this camera/monitor to the c-mount port of your microscope, you can view specimens or objects on the LCD display which are easy to see and to share the view with others. This setup features a built-in (30fps) camera which is great for taking quick photos and videos of your findings- it even includes a 4GB SD card to store your snapshots or videos, and a video output port for connecting to another external video monitor. Perfect for high-throughput inspection stations, Q.A. and Engineering labs, conference rooms, or anyplace you want to quickly and easily view a sample. You don't have to worry about booting up a computer or any of the related complexity and maintenance headaches. Wide viewing angle for multiple-viewer applications, conference rooms, etc.